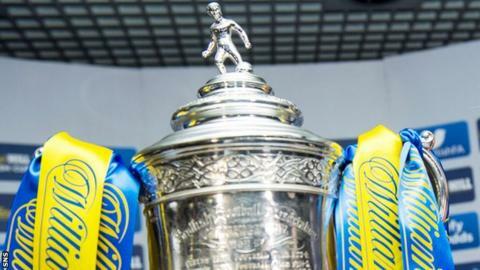 A four-year extension has been agreed with the Scottish Cup's title sponsor, the Scottish FA has announced. In addition to its support of the knock-out trophy, bookmaker William Hill will also continue to be the national team's official partner. And it will now also sponsor the South Stand at Hampden Park. William Hill's existing contract still had a year to run, but its investment in Scottish football will "now surpass the eight-figure mark", says the SFA. The company has had a seven-year relationship with Scottish football and the SFA says they "are also set to sign a betting integrity agreement in the coming months". The SFA announced the deal, which lasts until 2020, ahead of the draw for this season's third round.